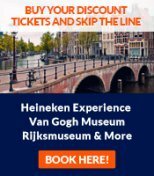 Thanks for visiting Amsterdam-Advisor.com. If you'd like to contact us, please use the form below. We at Amsterdam-Advisor.com are working hard to show you around town as easily and pleasantly as possible. Did you find this site was helpful? Then please help others to find it, and link to Amsterdam-Advisor.com from your Facebook page, Myspage page, blog or site. Every link helps!